Social media is just that. Social! It’s a great channel to introduce yourself, your product or your service to someone. Before social media, attracting visitors to your website was very challenging. The use of social media has created a worldwide network of engagement. With it, you’re able to attract people with your message, introduce them to your company and nurture them through their buyer’s journey. Social media can also be used to keep in contact and engage with current customers.When social media first burst on to the scene, it was viewed as primarily a B2C channel. Over the last few years, social media has become very important to B2B marketers. Many are using Twitter, LinkedIn and Facebook to engage with their buyer personas and establish themselves as thought leaders. If you’re a B2B SME that is still new to social media, here are 10 tactics that will help you get the biggest impact from your efforts. 1. Use the social media platforms your buyer personas use. 85% of marketers state that they use buyer personas for their content marketing. (Source) They should also be used to help you create your social media strategy. Find out where your buyer personas are engaging. Is it Twitter, LinkedIn, Facebook or another platform? Build your strategy around that information. 82% of prospects say they prefer targeted content and find it more valuable. (MarketingSherpa) Share information that is relevant to your personas and the challenges they are facing. Your company profile pages depict what you do. You don’t have much room to explain your business, so keep it concise! Hashtags have a lot of power. You can use them in your profile description, as well as in your posts or tweets. The main profile picture should remain the same across all channels to make it easier for your prospects to find and recognize you. It is important to follow the guidelines for each channel when adding photos and graphics. If you do not, you could end up with a profile that doesn’t represent you very well. Here’s a quick summary of photo requirements. As Peg Fitzpatrick and Guy Kawasaki say in The Art of Social Media, “optimize for 5 seconds”. Social media captures an audience that is known to exhibit short attention spans. People spend a few seconds looking, then venture to something else. A short, concise post with a relevant image will give the reader a gist of what it’s about, allowing he or she to clearly make the decision of reading more or moving on. Did you know that content with relevant images get 94% more views than content without relevant images? (KissMetrics) And according to QuickSprout, posting images results in a 98% higher comment rate. In fact, visual content is more than 40 times more likely to get shared on social media than other types of content. (BufferApp) That’s why it is so important to strategically include images in your social media strategy. For example, when coming across a post on Facebook, the first part a visitor sees is the image. Make sure that image is relevant to the article or piece of content you are sharing. Twitter allows you to attach and tag an image when you tweet. Tagging is useful when you have a specific person that you want to share the post with. This is an excellent way to engage with common visitors. LinkedIn is the best platform to share long, informative posts. However, studies show that longer posts are often skipped because of short attention spans. That’s why it’s important to capture attention of your LinkedIn audience with a vibrant, interesting picture that correlates with your post. I think this part goes without saying- people love the idea of placing an image with content, so be sure to provide one! 84% of B2B marketers use social media in some form. (Aberdeen) In order to catch someone’s attention on an increasingly growing platform, you will need to post frequently and consistently. On Twitter’s home-feed, you will come across hundreds of tweets in one single scroll down the page. Once you establish a relationship, it’s important to maintain the trust that your audience has found in you. Although you should be posting at a consistent time, it means much more than that. Respond to all questions and use the same tone. Your tone should be represented across all channels in the same unified way including images, language, habits and logos. No one likes interacting with an online robot. Auto posting to Facebook decreases likes and comments by 70%. (Digital Buzz Blog) Sending automated messages can hit a nerve with some people. Make sure if it comes from you, it sounds like you. Write in your own language and don’t set auto- reply for anything. It’s difficult to get the attention of your audience with competitors coming from every angle. Share content based on your own experience and research and don’t duplicate information from competitors or from similar industries. People will catch on or find the errors in your ways and never come back to your profile or website. When you provide something of value and worthwhile, consumers will begin to look to you as a thought leader and continue to turn to you for information. This is a great way to start a relationship and nurture these prospects into customers for your business. In order to understand buyer personas and their journey, you will need to monitor and conduct research. As mentioned before, when you know where they are and what channels they’re roaming, you’ll be able to respond to their questions promptly and further their confidence in your business. I have found that using monitoring tools, like Hootsuite, Tweetdeck or HubSpot make it seem less chaotic. With Hootsuite, you’re able to “see where and when your profiles are growing, the gender and demographics of your audience and real-time spikes in brand sentiment.” Tweetdeck is “a powerful Twitter tool for real-time tracking, organizing and engagement.” We use HubSpot to monitor different streams with the platform. Streams include hashtags, mentions or phrases pertaining to your brand and specific users. As you monitor and conduct research, be sure to measure results. 96% of social media managers measure number of fans and followers, 89% measure traffic, 84% measure mentions, 55% track share of voice, and 51% track sentiment. (Awareness, Inc.) This will help with your post frequency and more. If you have a platform like Google analytics or if you use HubSpot like we do, you’ll be able to monitor where visitors are coming from. If more are coming from LinkedIn, ensure you spend time on LinkedIn optimizing and sharing your most valuable and relevant posts. If no one is visiting your website via Pinterest, don’t waste your time. Every social media platform has its own set of “rules”. Twitter allows you 140 characters per tweet. This includes an image and link. LinkedIn is much more generous and allows 700 characters. Facebook is in between, but the ideal character count is 40 according to Fast Company. Earlier in this post, I shared how to optimize images for each platform- use these to your advantage for any shared images. Using social media should be enjoyable. If you don’t love it, it’s not for you! It’s a place to share your personality, get to know people online and share the background of your company. It’s a great way for people to learn about the culture of your business and what goes on behind the scenes. 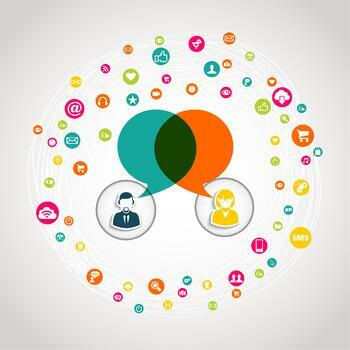 Social media in B2B marketing is a necessity! The evidence of implementing social media is overwhelming, as 43% of all marketers have found a customer via LinkedIn in 2013 (HubSpot State of Inbound) and 36% of all marketers have found a customer via Twitter in 2013. (HubSpot State of Inbound) For more social media best practices, be sure to check out @DemandCreator on Twitter or our LinkedIn page!